The knowledge that while out for a day of family fun I will have to, at some point, feed the children is enough to persuade me into staying home. Restaurants get expensive quickly, which defeats the purpose of going out to enjoy free or cheap activities or adds insult to injury when you’re already spending a fortune on entertainment and activities. Bringing along lunch is not always an option, plus no one likes walking around for hours on end with a purse full of ham. Here’s a list of hacks I’ve developed over the past nine years that keep my family of four fed and under budget. 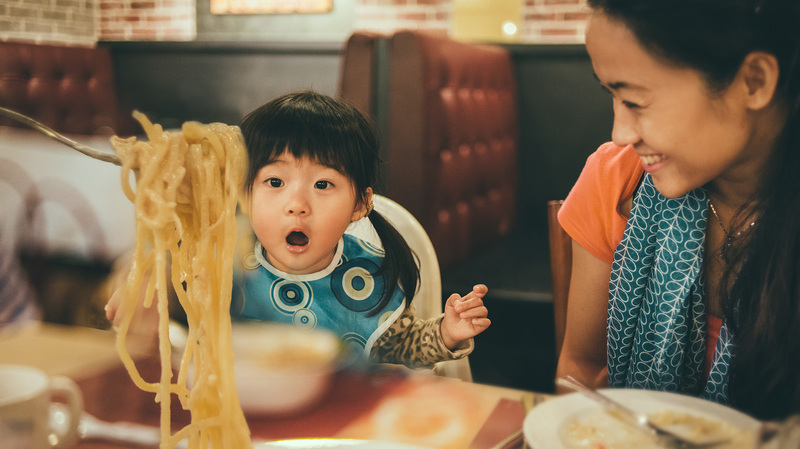 One of the reasons children love going out to restaurants is for the experience — it’s fun to be eating somewhere that isn’t home. Tap into that reasoning, and throw a picnic on the fly! No need to pack something elaborate back at the house to drag it around all day; just keep an old sheet rolled up in your car or bag. Swing by a supermarket, grab a pound of turkey at the deli, some crackers, fruit, olives, plastic cups and seltzer, and maybe a few treats for dessert if you can tolerate a sugar rush. Sharing food rather than packing individual items for everyone is cheaper and makes the picnic feel a bit more festive. Otherwise, it’s just eating home lunch outside, and where’s the excitement in that? Another excellent supermarket strategy: If you can’t have the romance of a lawn picnic, then head to a picnic area but bring hot prepared foods instead of standard luncheon fare, and eat with your hands. Sure, you’ll have to clean the hell out of everyone once you’re done, but it’s a lot of fun eating like cavemen, and the kids will love it. Grab foods that are easy to handle, like rotisserie chicken, grilled vegetables and large shapes of pasta. Make sure you have plenty of baby wipes handy, lest the kids end up glued to the back seat of your car with dried-up tomato sauce or you get followed around for the rest of the day by swarms of hungry animals. Editor’s note: Costco sells its rotisserie chicken for $4.99, and its hot dogs go for $1.50 each. Do your grocery shopping and feed the kids at the same time? Whoa-ho! We live in a big city where there are tons of fabulous ethnic restaurants, and we take good advantage of them. In many hole-in-the-wall places you’ll find some of the best food you’ve ever tasted — and cheap! I can almost always find simple things my kids will try, like pork dumplings, meatballs or cheese empanadas. You can feed a family of four pretty generously for less than $15, sometimes $10. It’s also an adventure in itself, and the kids will love the exploration factor. If your kids are hell-bent on getting restaurant food, hack it to slash your bill. Many chains have phone apps that feature coupons and special promotions. Order ahead, and get all your food to go, which will not only save you money on costly drinks and tips but will also save you the headaches of potential meltdowns from boredom or waiting for food to arrive. And skip the kids’ meals; order a couple of full-size items you can split, since ordering individually will just lead to leftovers you may have to throw out. My family usually gets by with two sandwiches cut in half, which come with fries, and an item or two from the sides department. You can use a lot of the same tricks from above: buying a large box of nuggets and fries instead of individual kids’ meals, supplementing with some items off the dollar menu and getting a supersize beverage you can share among all of you (they’ll even give you extra small cups if you ask nicely). But what about the toys? No point in going out for fast food and leaving without those, right? Well, one secret trick many people don’t know about is that most restaurants will allow you to purchase toys separately from the kids’ meal, meaning you can hack the food situation, make the kids happy and feed everyone for half the price. Everyone ends up happy and fed, you’ve saved a bunch of cash and come out looking like the best mom ever. You are a champion of lunch. You should feel good about that.